Tipping comes in almost as many forms as restaurant concepts. It is sometimes referred to as gratuity or a service fee. Restaurant tips can be collected individually by servers or pooled together. Tipping also changes from place to place. Tipping is forbidden in some places, like Russia and Japan, while in the South of France, it is the sole source of waitstaff’s income. In Europe, many restaurants add a service charge automatically to the bill. In the US, tipping is often left to the discretion of the dining patron. Fifteen percent is considered the minimum of a decent tip, 20% considered excellent. Lately, there has been a movement to eliminate tipping altogether - something that is met by with mixed reactions in the restaurant industry. Pooling tips ​refers to all the wait staff putting their tips together at the end of a shift and then dividing it evenly between them. The idea is that everyone will help each other out and work hard, to up the tipping pool. However, usually, someone is unhappy with pooled tips because they feel (perhaps rightly, perhaps not) that they did more work than the others and deserve more of the tip money. Many servers prefer to gamble that they will make more without pooling their tips. 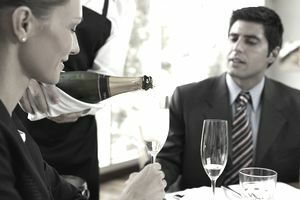 Catered functions and some fine dining establishments add gratuity, often referred to as a service charge, to the bill. It usually ranges between 15-20% of the total bill (before taxes). They then either divide the service charge up among staff as they see fit, or pay everyone a flat rate. Depending on which state your restaurant is located in, wait staff must be paid a certain wage. Some places require the flat rate of minimum wage, while others, like Maine, have a special reduced wage for tipped employees. It isn’t uncommon for servers’ paychecks to be zero after tips are factored in. Employees must claim their tips (at least part of them) for tax purposes, as well. A bad tip doesn’t always mean the service was bad. It can be a reflection of the food, the ambiance or cleanliness of a restaurant. Therefore it is important for the entire restaurant staff to work together, to ensure that every patron leaves satisfied. Big tips mean happy customers. Servers aren’t the only employees who should be tipped. At the end of their shifts, servers should tip 30 percent of their earning (give or take) to the bartender (who in turn tips out his or her barback), the host or hostess and the busboys. If you really want to win brownie points as a server, consider throwing five or ten dollars to the dishwashers as well, if it is a very busy night. They are often overlooked and have one of the less pleasant jobs in the restaurant. Some restaurants are doing away with tipping altogether. Danny Meyer, of Union Square Hospitality Group out of New York City, has shaken up the restaurant industry by paying a flat wage to servers in lieu of tipping. As minimum wages are raised across the country, many predict that this is the end of tipping in the United States.